It's been a Lemony Snicket kinda week here... you know, "a series of unfortunate events". Baking flops. Soccer injustices. And nightmarish skin reactions. We were in Wisconsin for 3 days and although I had grandiose plans for this week, I'm sorry to report there will be nothing grand from me here. You, however, never disappoint. And the internet is chock-full of thousands upon thousands of fab Halloween ideas. So, I thought I'd condense it and share my favs. Peruse. Bookmark for later. If you don't celebrate Halloween, I hope you will find something here that strikes your fancy. I'm confident that my friend Simoney from New Zealand (@ Great Fun for Kids) will. She is the queen of themed parties. So, without further ado... here is a hand picked selection of favs from blogs around the web. Enjoy. And as if that wasn't enough, here's more from some of my new favorite blogs. *The ones starred above have other great ideas and Halloween inspiration. Hostess with the Mostess (HWTM). Several fun Halloween treat ideas. Blonde Designs is a fresh blog with tons of great ideas. Their Halloween treats come from Martha Stewart. And of course there is TONS more inspiration from the big names. Click to get complete Halloween lists. Taste of Home. I love the meringue bones. Betty Crocker. Tons of great ones. I like the spooky spider cookies or the cobweb cookies best. Family Fun. The Scrumptios Skeletons look fun. Bakerella. I did these cupcakes last year. 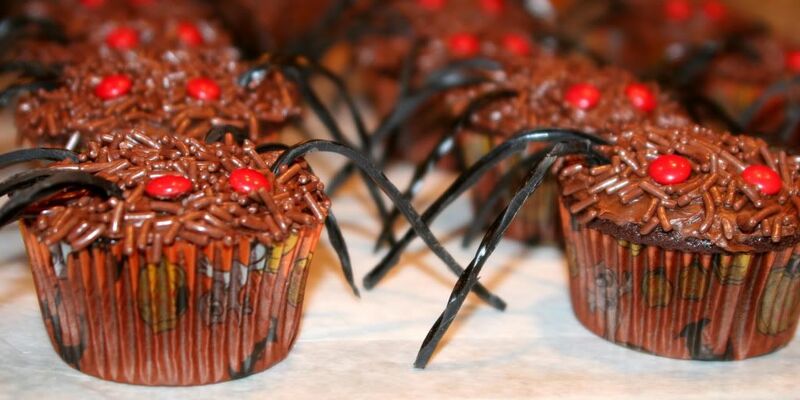 It ties in well with the lemony snickets theme, as I was unable to find the black rope licorice and ended up having to cut regular licorice in sixths lengthwise for 50 cupcakes (for a grand total of 300 legs). I call them my tarantulas. You can read more about them here. Family. Check out their Jack Skellington Cupcakes. And we can't forget good old Martha. The Halloween Whoopie Pies in this month's edition look rather tasty. Blonde Designs above also showcase some of their Martha favs. The directions said to give it 3 hours to 1 week (quite the gap??). I gave it 3 days and it STILL wasn't done. Hmm... and this is how they looked. The left one was by far the best and the stick is crooked. The right one is good if you didn't know it was supposed to have pupils. You might notice the one on top that we are calling a hat. And the other is still a mystery. 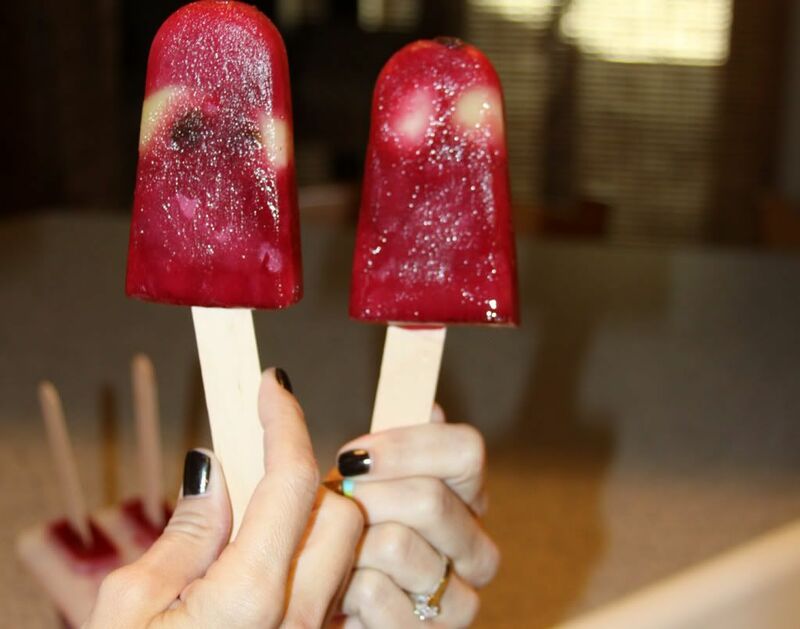 I can't help but wonder how many hundreds of tries it took to get their perfect popsicles. So, a bit of a flop. Martha is back to my crap list. Why oh why must she tempt me with such fun ideas? Have you had any recent flops? Come on, fess up. And what are your favorite blogs/websites for holiday recipes? As always, Happy Tuesday!! Grab the button and link up. P.S. Totally unrelated to food, you can also find me at Kludgy Mom talking about all things photography today. Stop by and pick up some great photo tips. What a great round-up! 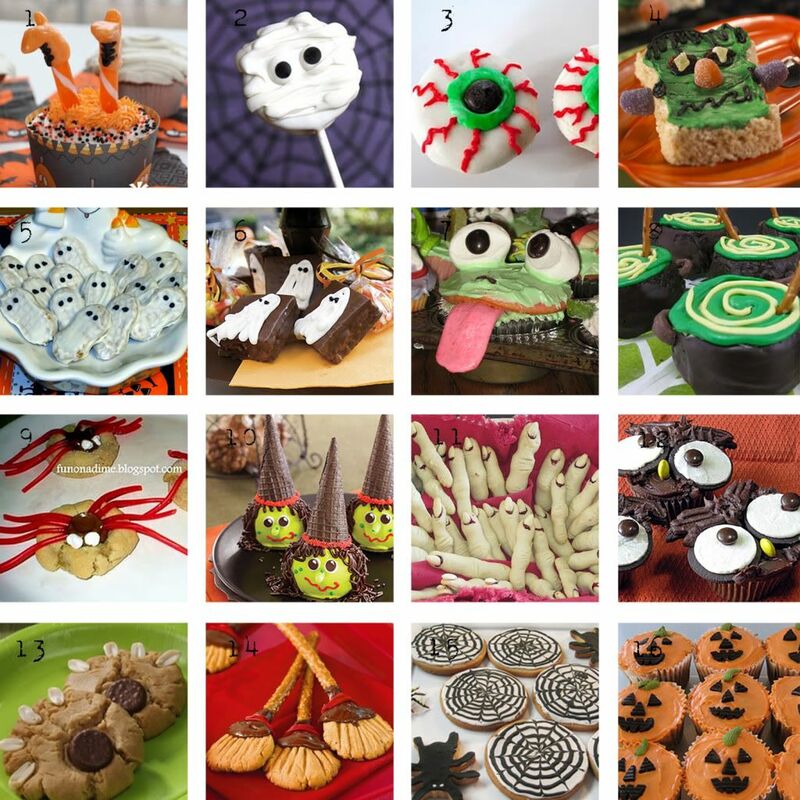 I'm planning Halloween Food every day next wk...so I may grab some of these ideas! Thank you so much for hosting each week! You always have some yumminess for us plus all the great links! Hi! Wow, LOTS of recipes! I wanted to use you button to link up (it's SO pretty; my favorite! ), but the code didn't work, so I just linked with text. I contributed a post on how to build a pancake bar. It's a hit over here! I love all the spooky food ideas! Thanks for the great link party. Can't wait to look at all the yummy recipes! I'm so amazed by all of your creations. They look like they belong in a Halloween magazine. Thanks for sharing these great ideas! My kids will be excited when I´ll make them. With gluten free baking, there are a good number of flops. I usually try to turn the flops into something good, but it's not always possible. Oh well, at least the pops will taste great. Martha's projects always end up like that for me too - and she makes it look so simple in the magazine! I love your smorgasbord of goodies - maybe I'll have to try some for my scrapbooking club this weekend. Fabulous features! Thanks for a fun paRty! So many great ideas here! I will definitely be bookmarking this. I need to make a treat for Alex's trunk or treat next week and one of these will most likely make the list! I've made the Nutter Butter ghosties (#5) before! They were so very yummy and super easy to do! You are amazing. How do you have time to find all this stuff on the web, create a post with beautiful photos, oh and run a blog hop at the same time? Thank you for the wonderful post today! What a great list of Hallowe'en ideas - thank you - and thanks for hosting Tasty Tuesday! what fun Halloween treats :) Thanks! I just had an "oops" last night -- tried to cook a chicken without removing the bag from the inside!! Eek. I love all of those great Halloween ideas!! I love Halloween for baking and all the fun it holds! What great Halloween ideas! I can't wait to check them all out! Thanks for hosting another great linky! Great post - thank you so much for all of the great halloween ideas! Hello! I love your blog!! This is my first time here! Thanks for hosting!!! Here's the link anyway..guess I'll try later...BOO! Thanks for featuring my cucpakes! You really put a lot of effort into this post and I appreciate it. I think I bookmarked every link I clicked! Great stuff!